Tasks N Todos - ToDo List Mgr – The Crème de la Crème of To-do Lists? Oh, the sheer satisfaction that taking care of a to-do list entry can bring! Yes, sometimes ticking something off a list can make you feel as though you've actually accomplished something, no matter if it's something as menial as remembering to purchase all of the items on your grocery list, or finishing a big work / school project. I don't know about you, but I love my to-do and task lists, and when I see how much I have managed to check off said lists at the end of the day or week, I always feel like giving myself a little pat on the back. We've tested a lot of to-do and task list apps for you, but that won't stop us from continuously prowling the Market and our App Center, always on the look-out for a new task/to-do list app that will help make our lives that much simpler. Our latest discovery: Tasks N Todos - ToDo List Mgr. Find out what we make of it in today's review. The first thing you will see when starting up Tasks N Todos - ToDo List Mgr is a is a long EULA (End-User License Agreement). Prudent users that we are, we read through the entire EULA and can safely say that everything seems kosher. Secondly, you are prompted to sync with Google Tasks, which works fine. According to the Market comments, there were some issues with syncing in the past – users encountered a lot of FCs and/or syncing would be interrupted before it was completed – but these issues seem to have been resolved since the latest update as we didn't experience any difficulties. Syncing with Google Tasks will be of interest to users who a) use Google Tasks on their computers, b) wish to sync between their various Android devices (phone, tablet) and c) want the extra security of backing lists up to the cloud. Syncing options (automatic, manual, on/off) can be adjusted in the application's settings. But what about users who don't use Google Tasks? Well, you can rest assured that you won't be missing out, because even without the added bonus of syncing, Task N Todos works great as a to-do list manager. Setting up separate to-do lists (mine include 'work schedule', 'household chores', 'fun stuff' and 'miscellaneous') is a breeze and very intuitive. Individual tasks can then be added to the appropriate list. Each task is given a name, and – if you so wish – you can edit in more details so that if you have a lot of similar tasks to deal with you can check the details to know which one is up next. Due dates can be set using a calendar. 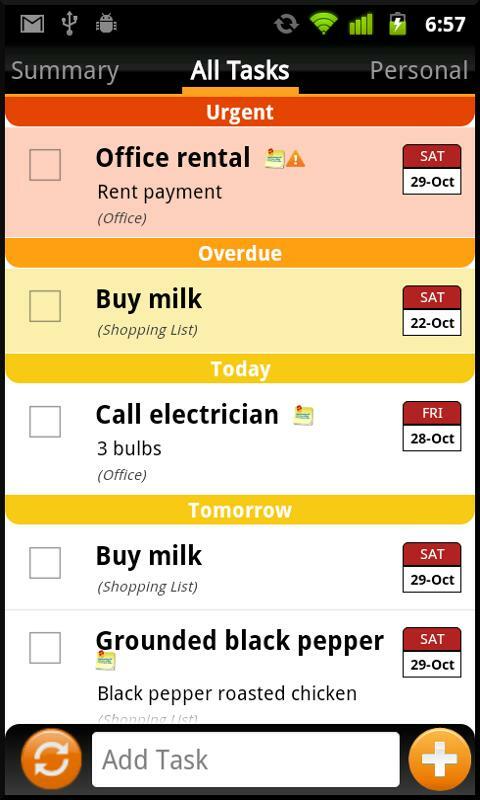 There is also an option to set a priorities hierarchy, which is visually easily intelligible thanks to its colour schema: tasks listed as 'urgent' are shown in an orange frame at the very top of the list, tasks due on the same day are shown in a yellow frame and those tasks due in the next week are set in a green frame. There's also an option for labelling something as a 'priority' (by clicking on the star) without listing it as 'urgent'. Deleting tasks is just as easy, and we do recommend deleting tasks (as opposed to simply barring them off your list) once they have been completed, provided the task hasn't been set as a 'repeat' task. Deleting things you have taking care of will help keep your task lists relatively uncluttered. Tasks can be set to repeat automatically and you will receive reminders every time the issue comes up again (e.g. 'Thursdays, 5:30PM: get ready to leave for piano lesson'). The reminders are easy to set up and reliable, but for lite version users it isn't possible to select which sound is to be used for reminders (i.e. the alarm sound rather than the message sound). Check out the pro version if you wish to select your own ringtone for reminders. Several widgets are available, allowing for fast and easy access to view tasks. The widgets come in several sizes: 2x4, 3x4, 4x3, 4x4 and one that will only run on Honey Comb and above. You can also select which Google account you wish to use to sign in/sync with. 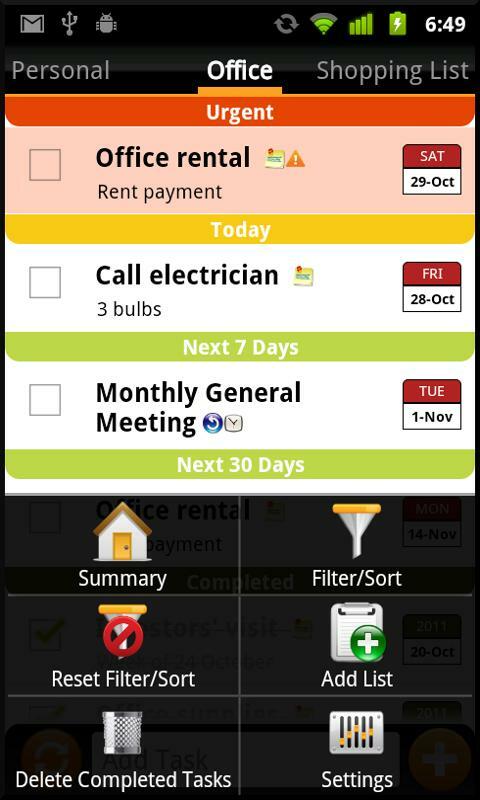 Tasks N Todos is optimised for both Android smartphones and tablets. It is currently compatible with Android 3.0/Honeycomb and has support for Android 4.0/Ice Cream Sandwich. Check out the application's settings if you wish to make a few basic changes to such things as: whether you want to receive a confirmation message before tasks are deleted from you list, select a default list (a summary, all tasks or one of your other lists), etc. Tasks N Todos - ToDo List Mgr is an intelligently designed and easy to use to-do list manager. We love how smoothly you can swipe from one list to the next and back to the overview, and we like the colour scheme that helps you stay focused on high-priority tasks. We also love that despite all the useful functions – such as assigning a scale of importance to tasks – the app does not feel over cluttered or obtuse. We also appreciate that the developers are so quick to respond to queries and comments, and that they provide excellent customer support. Features the application does not provide: a tool for estimating how much time each task is likely to take and a voice search tool. The only tiny drawback when it comes to this app is the app name itself: Tasks N Todos -ToDo List Mgr is quite a mouthfull, not to mention the wee spelling mistake (it's to-dos and not todos). Tasks N Todos - ToDo List Mgr's controls are excellent and the whole app is about making things as easy as possible for the user. Swiping? Check. Drag 'n' Drop? Check. The graphics are basic and, again, all about rendering the application as transparent and easy to use as possible. That said, I'm somewhat confused about the giant cheese that's sketched on empty screens—enlighten me if you know what that's all about. Tasks N Todos - ToDo List Mgr runs very fluidly. We did not experience any crashes, FCs or lagging. Tasks N Todos - ToDo List Mgr is available for free from the Android Market and the AndroidPIT App Center. Small ad banners are occasionally displayed at the very bottom of the screen; they proved to be completely unobtrusive on the Samsung Galaxy Tablet. 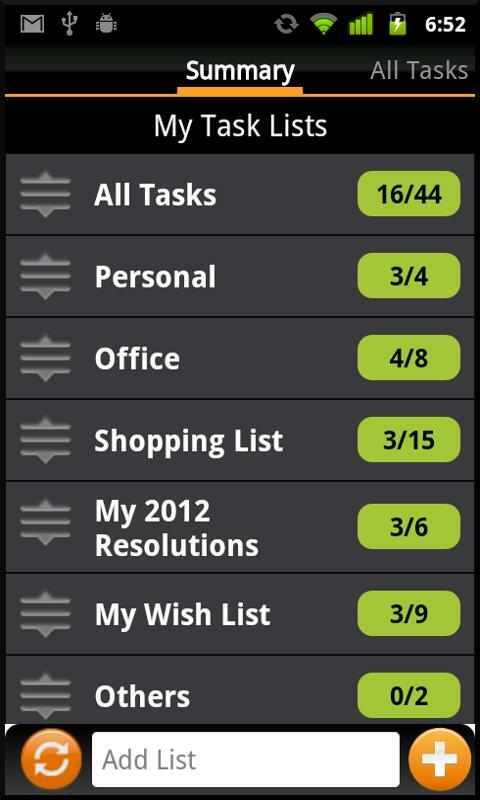 A full version (Tasks N Todos Pro) is available for EUR4,72 / US$5,94. David -- Thanks for commenting, and glad to hear that this app is helping you in your list-making-endeavours. I have to be honest -- I have reviewed a few other to-dos since writing this one up and I can't quite recall whether the points you mentioned are available in Tasks N Todos. So I'll just take you word for it and hope the developers are reading this and will update keeping their users' comments in mind! First things first - this is the best app around for managing tasks. There are some great features. In my mind, there are a couple of things which could be improved (unless I have missed how to do them). 2. It is too easy (with my size fingers anyway) to set the task to complete by flagging the box on the left hand side. Oops, Yadan, please ignore my previous comment, I see now that you were most likely referring to My Class Schedule (free). I haven't tried that one but will give it a go based on your recommendation, thanks! Yadan -- do you mean Timetabler Class Schedule? If so, I wholeheartedly agree with you, it's one of the better calendar apps out there, and you're quite right about Andreas - the developer - being helpful and forthcoming. But -- I remember the one thing that was a bit of a let-down for me when I tested Timetabler was that it didn't have a built in to-do list. I guess I really am a list maker at heart! "But I'm sure a lot of users are quite content quite content with simply using the stock calendar app". Heaven forbid! Stock calendars are fairly miserable; they lack vital editing functions and appear boring. There are much better ones on the Android Market; the one I use is "Class Schedule," which is specifically designed for teachers/lecturers like myself (or students) - but could be used as a calendar for anything and anyone. It is fully functional and colorful, and its developer is very responsive and constantly updates. Highly recommended! Not at all, Yadan, on the contrary: thanks for your thoughtful comment. I think alternative to-do lists are attractive to users who want to create seperate lists for different types of things they need to remember (e.g. work related stuff, grocery list, social calendar...), or who want a to-do list with a great design. Plus, you know Android users -- we're always looking for something new and exciting! But I'm sure a lot of users are quite content with simply using the stock calendar app. I know I'm going to get scorched for this, but I never really understood the benefits of having a To Do list as opposed to just listing these items in the calendar app along with the regularly scheduled entries. It takes the same amount of time, and listing To Do's on the calendar provides the advantage of seeing everything together. Perhaps I'm missing something, but To Do lists seem like a waste.